After spending several months climbing in and around El Chorro (Spain), the place feels like a home to me. 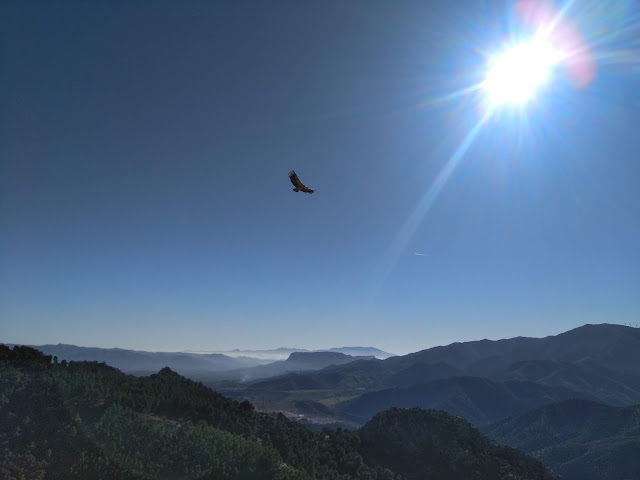 The sky-reaching Frontales in the middle of a rugged highland view with dozens of vultures is where my thoughts always wander. 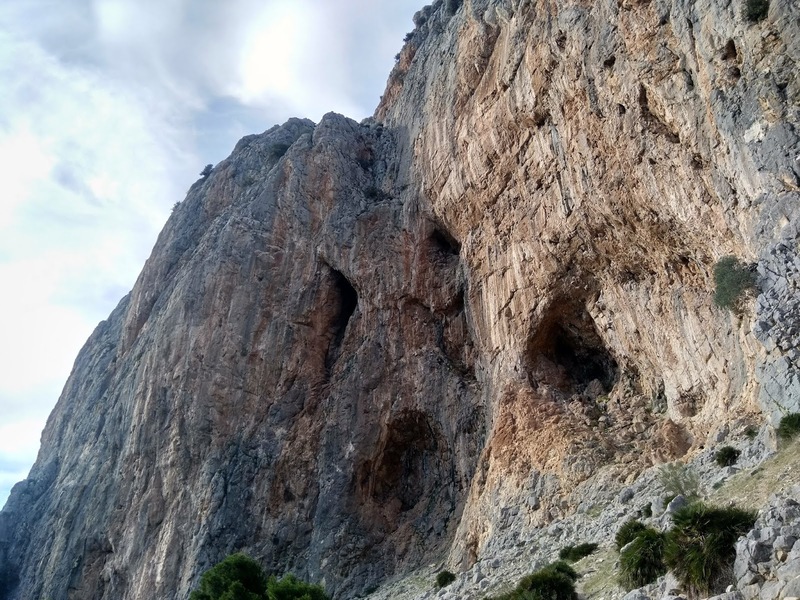 Those things are also the reason why you, my travelling and climbing reader, should visit El Chorro at least once in a lifetime. 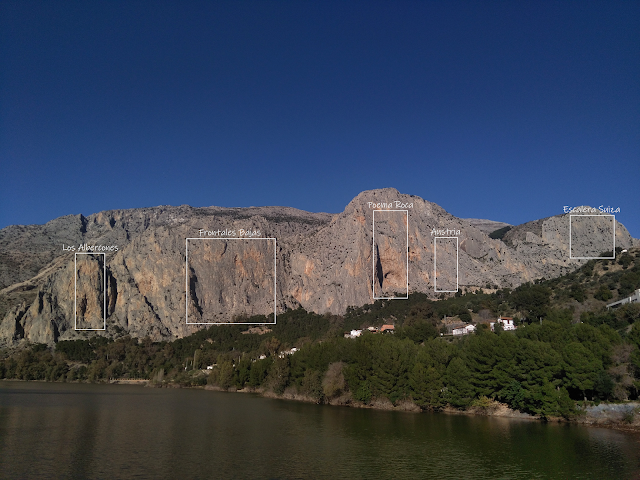 When it comes to climbing, opportunities in El Chorro are almost endless. It would take me forever to tell you everything about climbing in El Chorro, so this time I'm going to concentrate on the multi pitch routes east of Poema Roca. Yep, there's enough of them to entertain you for many sunny days! View from the top of Bombay Sapphire (6 pitches, max 6b) makes you forget to breath for a while. Let's start from the easiest multi pitch you can imagine. Despite having a dozen pitches, Blue Line (12 pitches, max 5c) is the perfect choice for your first multi pitch ever. The whole of Blue Line is well bolted, rock quality is excellent and climbing itself is quite homogeneous. All these things make Blue Line a better choice than it's near neighbour, Rogelio (11 pitches, max 6a). Unlike Blue Line, Rogelio has a couple of pitches you can literally run through. While galloping on the huge ledges makes you feel very safe, you're also likely to miss a pair of sneakers in places. Two pitches at the top are slightly harder than any of those on Blue Line, but not worth all the scrambling. Yeah, I know. Sector Escalera Suiza has a couple more multi pitch routes, that I haven't mentioned yet. Having no experience on those, I'm not going to mislead you by trying to guess how they're like. Looking for an easy multi pitch? There's a couple of them at sector Escalera Suiza. When you reach the top at sector Escalera Suiza, hiking via Escalera Arabe is the easiest way back down. If you're ready to move on to another sector and want to follow me and T's footprints, move your feet a bit closer to Poema Roca. At sector Austria, you'll find another pair of easy multi pitch routes just waiting to be climbed. Trust me, you'll enjoy both Valentine's Day (4 pitches, max 6a) and Bombay Sapphire! Valentine's Day is an excellent choice for pushing yourself a notch deeper in the excitement-filled world of multi pitch climbing. The route offers many pitches of steady climbing on good rock and a magnificent view. 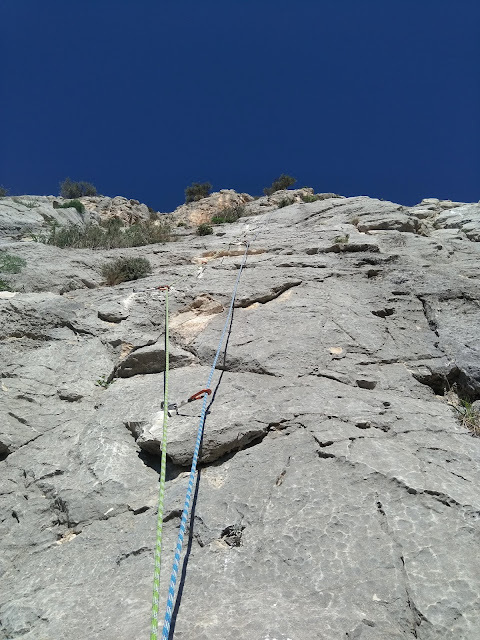 It seems to be possible to break the route in a couple more pitches, but me and T only have four marked on our guidebook (Escalada En Malaga 1: El Chorro). After Valentine's Day, Bombay Sapphire makes a natural next move. You can climb this wonderful line with in two different ways, that are almost the same in grade. The solid limestone is enjoyable to climb – except for the last pitch, that feels kind of redundant. The steep gray slab at sector Austria is pleasant to climb. In case you're looking for something a bit more challenging, step in the cave of Poema Roca. Me and T have a guidebook from year 2013 and in that book the easiest multi pitch at Poema Roca is around 7a. If you're tough enough to crunch through a 7a crux, I bet you'll fall in love with the cave as well as the overhanging wall above it. And when you do, make sure to tell me about your adventure! Anyone up for an overhanging multi pitch? Take a look in the direction of Poema Roca! In case you missed out on the first post about multi pitch climbing in El Chorro, you can still find it here. 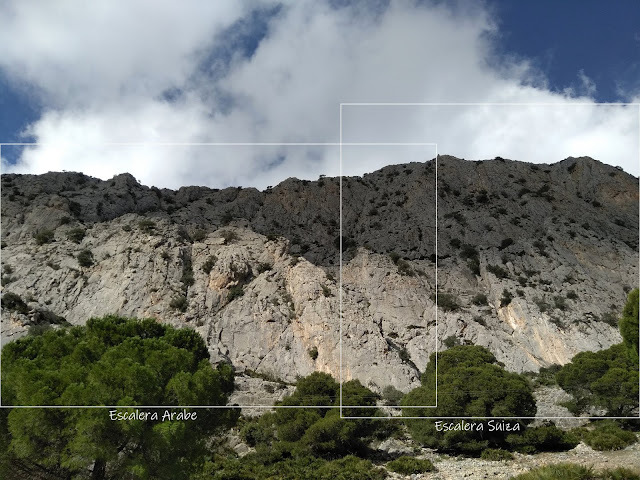 Remember to check out the posts about El Turon and Desplomilandia – two beautiful, but totally different crags near El Chorro – as well! Chulilla is one of the more popular climbing destinations, that we've visited so far. The name started popping up as soon as we left Lisbon area and headed towards Spain. "A ton of long, vertical routes", "soft(ish) grades, if you manage to find the rests", "wonderful place to camp" were some of the things we heard about Chulilla before arriving there. And were the rumors true? Read on to find out. These tips for climbing and camping in Chulilla are based on first-hand experience around April 2018. You know the "it", that calls you back to a crag time after time? Yeah. The sunny face of Frontales in El Chorro truly has that. This time it summoned me and T to climb some badass multi pitch with a mesmerizing view and clear sky. We went up and down the two hundred meters high wall several times, so I decided to divide our experiences in two different posts. 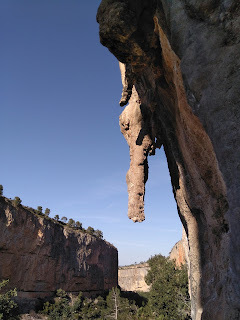 First I'm going to tell you a bit more general info about multi pitch climbing in El Chorro as well as share some tips and recommendations on multi pitch routes near the gorge. After that, I'll move on to the routes near the wicked cave of Poema Roca. You can think of the posts as my non-material Christmas present to all of you looking for a great autumn or winter climbing destination! El Chorro Climbing Shop: Where To Buy Climbing Gear In El Chorro? 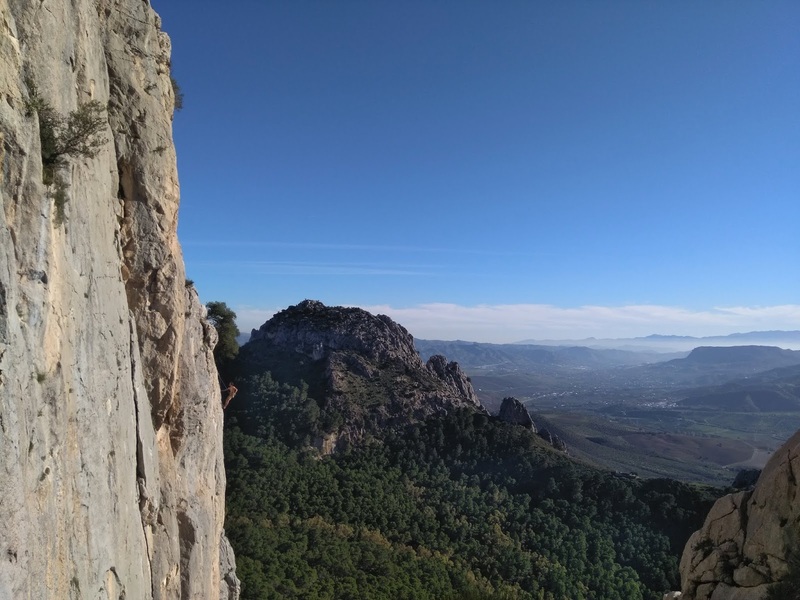 Let's imagine, that you're on a road trip and heading towards the world-famous El Chorro to do some climbing. But you're missing a guidebook and a few extra quickdraws would be nice, too. Perhaps you also discovered, that your rope is too short for the lengthy routes. 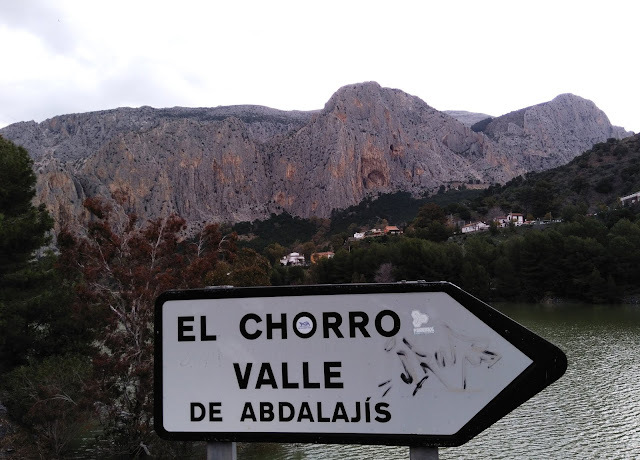 So, where to buy a topo and other climbing gear in El Chorro? Option number one is to visit the climbing shop in El Chorro. The shop is called Aventur El Chorro and it's located about 3,5 kilometers uphill from El Chorro train station. There's a small selection of climbing gear and clothes for sale. You can also buy El Chorro climbing guidebook from Aventur El Chorro, like we did. Our version of El Chorro guidebook also covers Desplomilandia and Valle de Abdalajis, and in January 2018 the topo cost 25 euros. I consider the price very reasonable, even though some of the photos could be quite a bit more accurate.